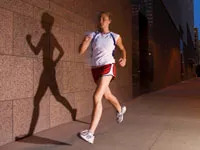 With daylight saving time ending this weekend, many walkers and runners will soon find themselves pounding the pavement in the dark. And while morning exercisers will get a bit of a boost from the lighter sky, it won't last for long. But that doesn't mean you have to resign yourself to traveling the sidewalk or going nowhere on the stationary bike at the local gym. Be visible. Wear at least one major reflective piece (I'm talking about a vest, jacket, or belt, for example—that tiny silver logo on the ankle of your black running tights isn't going to do the job). This way you'll be seen by whoever might be traveling the road. Don't have one? Click here to read about some of my favorite after-dark workout wear. And for even more visibility, clip a flashing light onto your waistband. Go against traffic. You want to be able to see oncoming cars so you can get out of the way if the driver doesn't seem to have registered your presence. (And trust me, that applies to the majority of folks on the road after dark.) If you can, choose streets with either a sidewalk or a wide, flat shoulder. Leave your iPod at home. I'm not saying Lady Gaga isn't an awesome workout partner, but you need to be able to hear approaching vehicles, especially if you live in a hilly area (as I do), where you can't rely on headlights to clue you in. Plus, you'll want to have a heads-up when someone is approaching on foot. Carry your cell phone. You hate to think there'd be an emergency, but let's be realistic: It happens. And if it's dark, fewer people will be around to help you. Make sure to have your ID with you, too (I love my RoadID wristband—no need to pull my license from my wallet and hope I'll remember to put it back). Another idea: Invest in a Travel Stix, a nifty credit-card-size flash drive that stores your medical and contact info. Buddy up. Not only is it safer when two people are running together, but having a workout partner is a great motivator too. It's not easy making yourself get out there at the crack of dawn or after a long day at work, so it helps to know someone's counting on you to do it. And hey, the whole darkness thing isn't so bad. Think of it this way: No need to worry about what you look like!